Pan-a-ma----Is a country of southeast Central America. Columbus landed on the Caribbean coast in 1502, and Vasco Nunez de Balboa first crossed the Isthmus to gaze on the Pacific Ocean in 1513. Controlled by Spain until 1821, the area then became part of Columbia. U.S. desires for an isthmian canal led to a revolution and independence in 1903. Panama is the capitol. Panama City, the capitol is the largest city of Panama. It is located in the central part of the country on the Gulf of Panama. The original city was founded in 1519. It was destroyed in 1671. It was then rebuilt a short distance away in 1673. 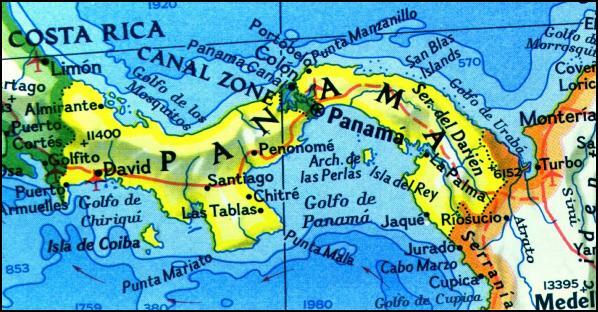 The population of Panama City is about 389,172. The population of the country is 1, 795,012. 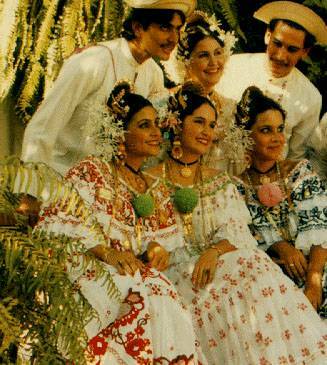 A native of Panama is referred to as a Pan-a-ma-nian. La Pollera is the most beautiful dress in all the world! It stands out in its simplicity and eye catching appeal at any fiesta. 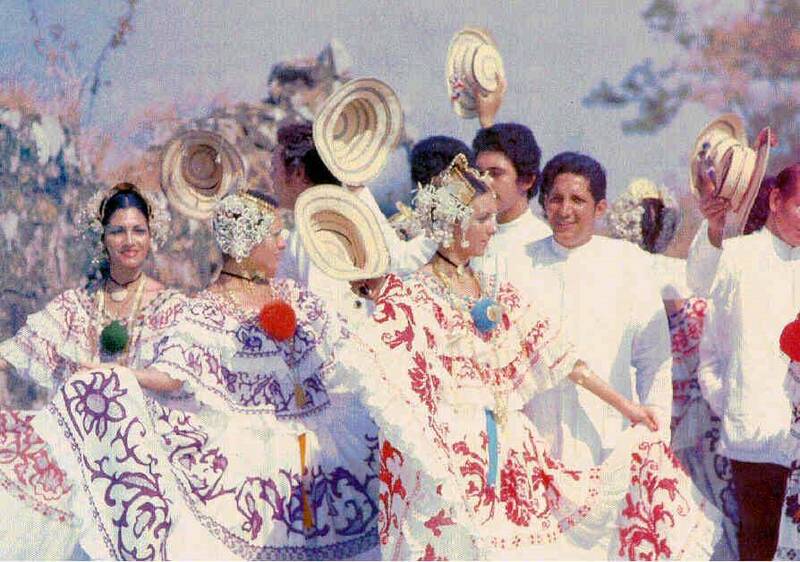 Throughout the world, La Pollera, the native party dress for the beautiful Panamanian woman is number one. Viva La Pollera, Viva La muejer Panamanian and Viva Panama! Here we see a groups of dancers taking a break. Good thing I had my Kodak Brownie. Panameno, panameno panemeno vida mia yo quiero que tu me lleves al "Tambor de la alegria" Here is where I would free-lance....and I would pick up again with.... 'Yo quiero que tu me lleves...Al Tambor de La Alegria ....hum.....hum and casate con policia Que ganon noventa pesos trabajando noche y dia 'Yo quiero...' Yo quiero pasear en cohe y tambien en el tranvia 'Yo quiero...' Yo quiero que tu me lleves donde esta la vida mia 'Yo quiero...'que tu me lleves al Tambor de La Alegria! La musica (the music) gives you wings as your feet follow along to the beat of the big drum. A woman of beauty is a joy forever.